When your vehicle is being serviced at F&F Automotive we make sure your wait is as brief as possible and comfortable. We have a spacious waiting room with padded chairs and armrests and a big screen TV to help you pass the time. Have work to do while you wait, or need to check your email? No problem, we offer free WiFi with speedy Internet access. Speaking of free, we also offer coffee, water and snacks at no charge as well, and a private restroom. 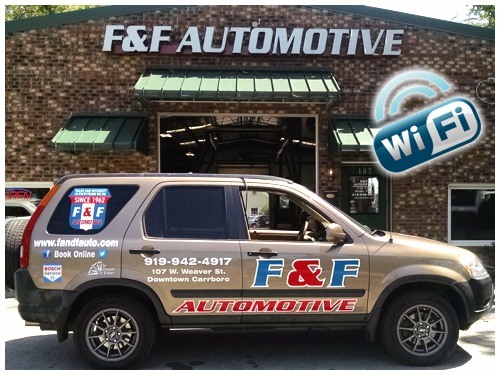 F&F Automotive also provides a FREE SHUTTLE SERVICE if you do not have the opportunity to wait until your vehicle is ready. We'll pick you up and take you back at no charge. Shuttle service is available Monday through Friday from 7:30am to 4:30pm. At F&F we always strive to make your visit with us a pleasant one! Bring your vehicle in to F & F Automotive today for a quick and efficient State inspection.